As I have said many times before, I love Red Sonja. She was the first “person” I wanted to be growing up. All I needed was a sword to go with my horse, which I already had (Texas girl here). 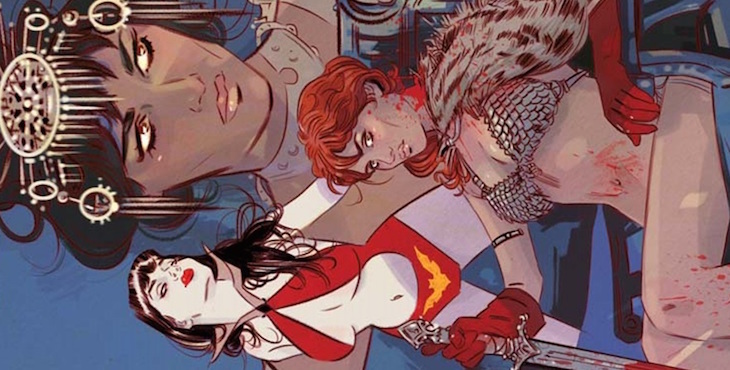 When Gail Simone announced that she would be rounding up a group of female writers to tackle such iconic lady characters as Red Sonja, Dejah Thoris, and Vampirella in a huge cross over event, I was more excited than Jessie Spano on caffeine pills. And since the fabulous folk at Dynamite send us advanced reviews, we decided to organize a HUGE event around Swords of Sorrow! If you don’t have any idea who all of these characters are, have no fear for WWAC is here! We will be providing character histories and backgrounds for context, but the series is also set up so that readers can jump right in without having to know all the characters’ backstories. But being that this is a group of women writing characters often written by men, we think it’s important to explore their backgrounds in order to get a feel for how the writers are acknowledging and in some cases subverting past characterizations. But, wait, that’s not all! In addition to character histories and backgrounds, we will be doing reviews, conducting interviews (Gail Simone is in thanks to Megan Byrd! ), writing analyses, creating themed lifestyle posts, and much more! We hope you, dear reader, will jump in on the comments and share your thoughts on the series, as well. More heads are better than one, after all. Are you excited? Are you like so exited?! Because we sure as hell are.